Enjoy live ballads, cheerful decorations, and a hearty plate from Magee's. Enjoy live ballads, cheerful decorations, and a hearty plate from Magee's Kitchen at the Original Farmers Market on Thursday, March 17. When one visits a public market that's home to several types of foodstuffs — pastries and tacos and crepes and hamburgers — the rule of selecting your supper kind of goes like this: What stall has the longest queue? OK, that isn't always the tried-and-true where-to-eat guide for the typical gourmand, as responding to your own cravings isn't always dictated by the lengthy lines you see before you. But if the date is March 17, and you happen to walk inside the clocktower-y landmark at Third Street and Fairfax Avenue, the chances are good that you will head for the spot with all the people crowded near the counter: Magee's Kitchen. 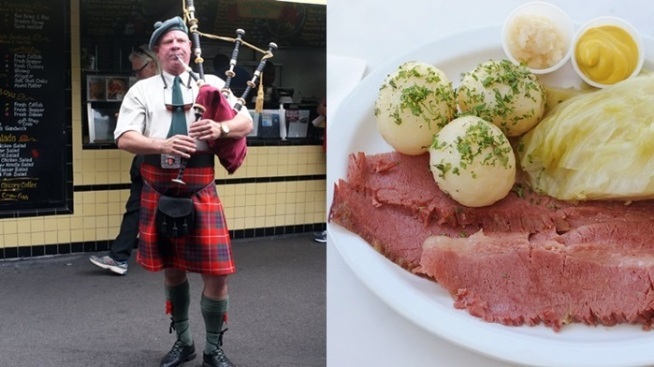 It's one of the oldest purveyors at the landmark Original Farmers Market, and it serves up one of the crave-iest holiday dishes in town: A classic corned beef with a side of new potatoes, some cabbage, and a bit of horseradish and mustard, if you please. There are queues, as sure as a shamrock grows upon the ground, come St. Patrick's Day, but as long as you're ready for a bit of a wait, you'll get your plate of savory goodness. Admiring the sparkly green decorations, and the festive clothing of your fellow queuers, is a fine way to pass the time. From there, take your plate and make for the music. There shall be live tunes throughout St. Patrick's Day, as is tradition at the market. Glen the Bagpiper will walk among the stalls, be-bagpiped, from noon thirty to half past 3 o'clock, while Stuart Marks & The Paddy O'Dors Band will play the rockin' Irish-inflected tunes during the evening. There shall be green beer for sale, too, at both Farmers Market bars (as well as imported beers, too, so raise that Guinness). Do people dance at this free shindig? They do slap a knee and kick up a heel, yes. Do people wear green? Lots of it, so don your pinch-proof clothing. Does everyone eat the corned beef from Magee's? Well... that's up to personal taste, but a bunch of revelers do, as is tradition. Just hop in the queue, knowing that a line often signifies a plate that everyone's after. And that plate, on March 17, at the Original Farmers Market, can be found among the shiny emerald wall hangings at Magee's Kitchen, near the east patio.